Soccertackle supply various types of 24'x8' adult football goals. For locations where goalposts need to be removed from the site we have lightweight portable goals that dismantle and fit into a 2.8M carry bag. These are used by most tournament organizers and are the only full size goals that fit in carry bags. Once installed they look the part, they are sturdy and can take the hardest shots. Folding lockable goals are ideal for locations where goals need to be walked into position and then stored after the game. These are ideal for pre match warm ups at professional grounds as they are quick to install and easy to store as they take up very little room. They are safer as the sides lock in position and do not swing about as with other folding goalposts. The full size Freestanding elliptical adult football goals are easier to use than other goals with heavy rear rollers and back frames as they are much lighter and safer. They offer anchor systems that enable back bars to become fully self weighted if required however, due to the unique counter balance system,they can be moved around without the internal weights. With fully welded side frames they do not expand and work apart as do other integral weighted freestanding football goalposts. These are much better for quality playing surfaces as they do not have 180Kilo ground frames compacting the surface. The wheel options (see moving the goalposts) are more adaptable and do not bend inwards as with other wheel attachments on other goal posts. A lightweight aluminum 70mm tube is also available for training which can be packed away with the net attached to the side frames. To quickly install the goal it is possible to pull the side frames apart with the net attached and then fit the crossbar and back ground frame in the same way as with the smaller uPVC goalposts. This is safer as it is a lower weight than any other freestanding goalposts. We do not supply heavy steel freestanding goals as we consider these to be dangerous.We have been campaigning for these to be banned for many years and recommend that such goalposts be changed for safer lighter products. Adult goalposts in permanent fixed positions are usually used by local authorities or clubs. The Anti- vandal Anti-theft goalposts are the strongest and safest goalposts for such locations. These unique secure lockable goalposts are only available from ITSA GOAL,they do not rely on nuts & bolts and they are fully accountable to the key holder. They are totally secure unlike other versions that only lock uprights into ground sockets allowing crossbars to be easily removed and then uprights. Other basic technology steel goalposts that rely on nuts & bolts are available and these are supplied with crossbars that attach to the sides before being inserted into the ground sockets which ensures crossbars can not be easily removed. Socketed goalposts where crossbars are dropped onto of uprights are easily unbolted by vandals making them more dangerous as they can be lifted and dropped without too much effort. If you are considering buying nut & bolt socketed goalposts we would always recommend the safer versions where crossbars are fitted side ways into the uprights and not dropped into the top of the uprights. The less expensive self-build aluminium stadium goals have mitred corners that are only held together with internal brackets bolted together. (see picture below). These need constant maintenance and re-alignment as they come apart due to expansion. Fully welded stadium goal post corners include strong internal brackets that stay firmly together and require no maintenance. Stadium football goals made by us do not tilt backwards when nets are tensioned and all include flush locking ground socket caps not loose drop in caps that can be quickly lost. A unique post locking system is included to prevent unauthorised removal of the goal posts which is not available on other stadium football goals. The very latest net fixing system is included which just needs to be rotated to secure net inside. The fixings allow the net to be removed quickly if required and the unique design enables them to also be secured in a permanent position when nets are to be left attached to the posts. The "key" difference is the unique patented system that locks posts in position, removes the need for bolts and the need for customers to build the actual goalposts. The posts come ready to drop in place, a lock is inserted and they are ready to go. They cannot be removed without the key holder’s consent giving full accountability. All expansion and contraction problems found on other stadium goals is alleviated. The posts require no ongoing maintenance, tightening of bolts or re-alignment. The goals are manufactured with the latest CNC and laser cutting technology ensuring all the posts are interchangeable. Crossbars lock to uprights and once fitted they do not need adjustment. The stadium goals are made to a slightly bigger European profile, conform to EN748 and are ideal for televised matches. 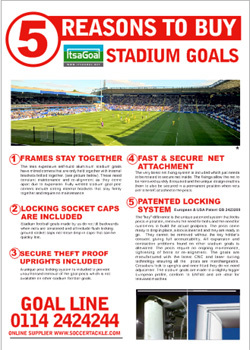 CLICK ON THE LEAFLET TO DOWNLOAD THE 5 REASONS TO BUY ITSA GOAL STADIUM GOALS.